The Urban Infrastructure Lab (UIL) at the University of Washington, under the direction of Professor Jan Whittington, brings together students and faculty with a shared interest in the planning, governance, finance, design, development, economics, and environmental effects of infrastructure. Collectively, our interests span the systems critical to economic and social well-being, such as energy, water, health, transportation, education, and communications. Across these sectors, our studies integrate empirical and applied methods of research to discover the means to obtain long-run objectives, such as decarbonization, resilience, and information security, through decisions made today. UW Solar 5.0 is online! At the beginning of the fifth academic year for UW Solar, we are ready for more exciting projects! Solar arrays on Alder, Elm and Maple Hall were one of our main focus for the past two years, and we were happy to see the project was completed at last March. From now on, UW Solar will start to look at the system performance and the research opportunities from the data stream. The new Life Sciences Building under construction contains one really fascinating feature related to UW Solar – Building Integrated Photovoltaics for shadowing fins. 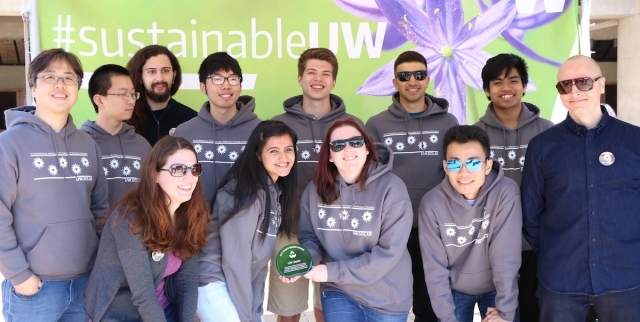 This year, our group will keep providing support for this cut-edge technology to be applied on UW campus as the pioneer for all educational institutions in the U.S.
Last but not least, we are forming a campus plan for all UW buildings where solar energy might be applicable. UW Solar ‘s ultimate goal has always been making UW more sustainable by integrating renewable energy sources as much as possible! Our new solar project made the news! Comments Off on Our new solar project made the news! New year, more solar! Comments Off on New year, more solar! UW aids city of Seattle on open data initiative. Comments Off on UW aids city of Seattle on open data initiative.